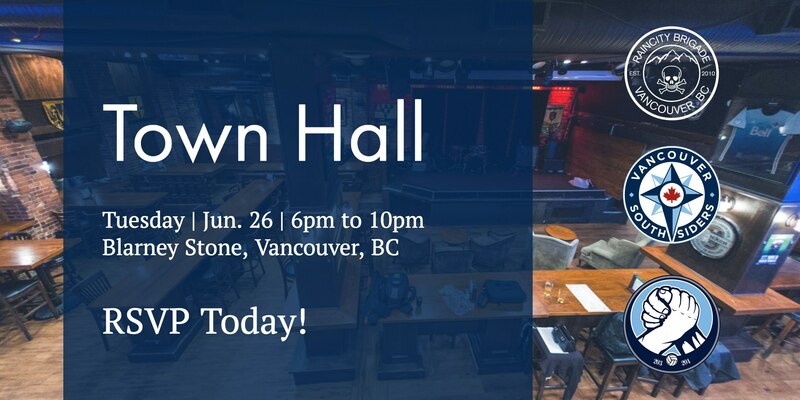 Vancouver Southsiders | Supporters&#8217; Town Hall Announcement! The Supporters have questions and the Whitecaps front office is ready to provide answers! The event will kick-off at 7:00pm; seating will begin at 6:00pm. Tickets are $5 ($5.50 after card processing fees) and can be purchased here. The format will include a Q & A period with two moderators so bring any and all questions you may have for the Whitecaps organization! IMPORTANT NOTICE: This event is for members only. If the organizers are unable to confirm your membership within one of the three supporters groups (Southsiders, RCB or Curva) you will not be permitted to enter this event. There are no refunds on ticket purchases. All proceeds for this event will be designated to the charitable funds of your Supporters’ Group! Q: Will this be broadcast online for members who are unable to attend? A: No. The Whitecaps have stated they are willing to answer all of the Supporters’ questions, including questions relating to business matters that are not necessarily ‘public’ knowledge. At this point, we feel putting them in front of cameras will change the organic nature of the conversation and potentially compromise the answers the Supporters will be given so we have opted to make this an intimate conversation versus a press conference. Q: I am not a member, but I am a Whitecaps season ticket holder so I bought a ticket. Can I still come? A: You must be a recognized member of one of the three major Whitecaps supporters groups in order to gain entry to the event on June 26th. If you are unable to provide proof of membership to the SG you RSVP’d via, your ticket will be re-sold. Tickets are non-refundable. If you would like to purchase or renew your Southsiders membership, you can do so here. Q: Are minors permitted to attend this event? A: Minors are only permitted at Blarney Stone until 7pm, so unfortunately no minors will be permitted to attend. Q: Can I ask the panel anything I want? A: We encourage you to ask the panel any questions you may have that relate to the Whitecaps organization! If you would like to ask a question, you will be required to write it down and pass it to the moderator at the microphone in the crowd. If your question is deemed to be disrespectful, rude, or off-topic by the moderator, it will not be passed along to the panel. That being said, we do expect the Supporters to ask the hard questions of the Whitecaps front office and get the answers they’ve been seeking all season. Q: Tickets appear to be sold out online. Am I out of luck? A: Not necessarily. We will have a queue outside for anyone who was unable to purchase tickets online prior to the event. At 6:55pm on June 26th, we will be checking attendance and if we are under capacity, we will be opening the doors to members who do not have tickets. Q: I’ve already purchased a ticket. Do I have to be on time? A: We strongly encourage you to be on time for this event as we are expecting Blarney Stone to be at full capacity. If you are not in attendance by 6:55pm, there is a chance you may lose your spot at the venue.